Much like the 450D, the 500D's custom functions are all listed on a single page. 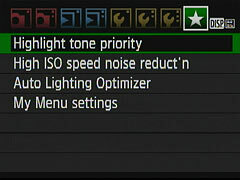 They include quite useful feaures such as Highlight Tone Priority. This is considered important enough that its status is indicated on the rear LCD panel when it's turned on, but not important enough to stop it being buried as Custom Function 7. 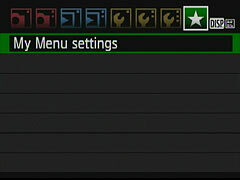 The 'My Menu' feature on the EOS 500D allows you to produce your own custom menu made up of any of the cameras menu options (including custom functions), which means that previously buried but useful options such as mirror lockup can now be brought to a top level menu. 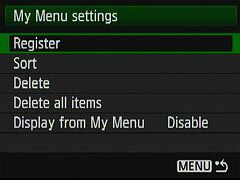 And, if it's the last menu you used, it'll be the one that confronts you when you press the 'Menu' button. 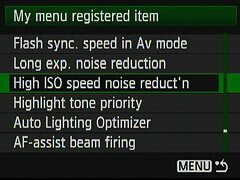 My Menu isn't available in the camera's automated 'Basic Zone' modes.